Harnesses have become a necessity for any dog owners who love to take a walk with them. They’ve also proven to be extremely useful when strapped with a leash for keeping an eye on your Chihuahua. You can even find this beneficiary during jogging. Comfortable harnesses are always preferred as dogs will be considerate in wearing them for a longer period of time. But Chihuahuas need an extra amount of care, as they are smaller in size. So, their harnesses need to be compact in size, as well as lightweight for the tiny dog to be able to keep wearing it. Another major reason that makes the necessity of a Chihuahua harness so high is that Chihuahuas are excessively smart. They can get out of any regular dog harness or collars so a specially designed harness is required for the little fur buddies to stay in place. 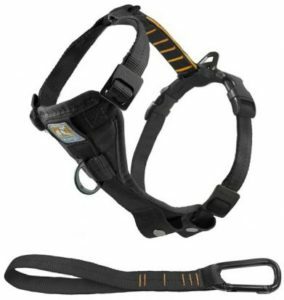 This harness comes in different stylish outlooks along with a sturdy-durable design. With adjustable straps added, the harness can be easily fitted to a dog of any size, even Chihuahuas. It also comes with nylon webbing mated with a reflective material so that the owners can always spot their dogs. The smart design engineering also ensures comfort in the wearability of the harness for your dog. Once the straps are tightened according to the dog’s size, the harness does not come loose. This will ensure the Chihuahuas stay in place. They will not be able to escape out of their harnesses. 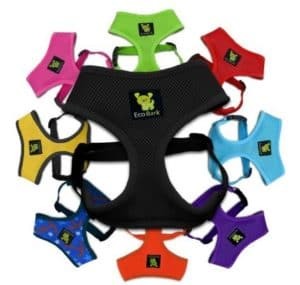 The color selection of the harness is wide so users can choose the one that appeals to them and their dogs the most. Dogs are known for having their own taste and if they do not like something, they will not wear it. The front buckle in the design is oddly placed. Hence the leash tends to get tangled. Chihuahuas are particularly known to be hyper and always jumping and hopping during regular jogs. This will make it really hard for the users to be in control of the leash if it keeps getting tangled with the harness. The Kurgo Tru-Fit harness comes with a lifetime warranty. They provide an instant replacement for any manufacture defect. The design of the harness is adjustable so that dogs can wear them for a long time. It also comes with a dog tether for seat belts so that your Chihuahua is safe during travel. 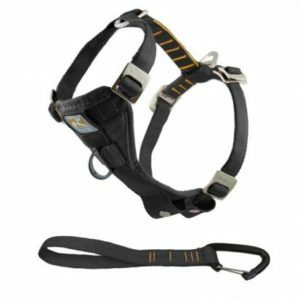 The thick metal hardware makes sure the design of the harness remains crashproof. This addition had been tested officially to ensure the safety of your little Chihuahua so that no harm comes to them. The Kurgo Harness comes with many points of change. Multiple adjustment points also ensure a nice, standard fitting. This makes sure the dogs do not slip and slide when they are jumping and hopping during their walks. Other harnesses in the market can successfully register the pulling of the leash and the tension is well registered. However, this particular harness ring remains attached to the leash and does not budge. This only makes sure it stays in place with the dog’s chest but does not recognize the pulling tension. The Kurgo Tru Fit No Pull also comes with a lifetime warranty. These harnesses come with a comfortable fit harness for your Chihuahua. 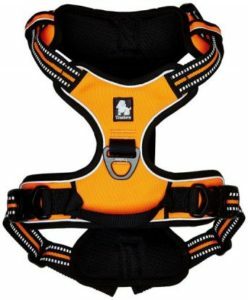 This features five adjustment points so that the fit of the harness falls perfectly with your dog’s body. The No Pull feature from its name is uniquely engineered. The tension from the leash will result in them getting pivoted backward, eventually not moving anywhere. The inclusion of a dog seat belt is extremely convenient as Chihuahuas are tiny like babies and extra care must be taken when they are on a drive. The adjustment points installed in the harness make sure the fit remains budge-proof for the Chihuahuas. As they are constantly jumping around and have extreme levels of movement, they will need a harness that knows how to stay in place. It has the option of attaching the leash from both back and front; whichever suits the dog's comfort. Since the build of the whole harness is very sturdy, it does come off to be heavy when Chihuahuas are in question. The Original EcoBark Maximum Comfort and Control surely does not shy from its name. 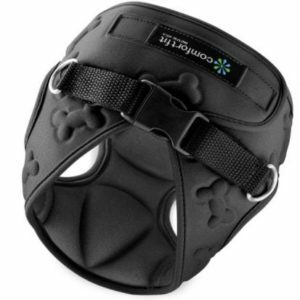 As it suggests, the material and design of this harness are made extremely soft and durable. The comfort and durability are guaranteed to assure that no matter what mischief is thrown at it, the harness stays in one piece. The breathable fabric allows dogs to be able to wear it for a long time. Chihuahuas are usually very restless; so the more comfortable they feel, the more wear time it will allow. The adjustable belt of the harness provides a better fit for the little Chihuahuas. ​The product is specifically designed for smaller dogs like Chihuahuas. The fit of the harness molds well with a small body structure, making it extremely comfortable for the dogs itself. The Alfie Couture Designer Pet Harness comes with collar options of different sizes, hence your Chihuahua can easily feel at home in the one that fits perfectly. The lightweight and soft material of the harness keeps it super hassle-free for the Chihuahua. This allows them to move around and makes sure no external pressure is exerted on their soft bones. The material is also machine washable so you can always have a clean harness ready for your pupper. To top it off, it is paired with a matching leash with D string for ease of attachment so that you can go out with your dog at a moment’s notice. The strap and the Velcro at the back help it fit the shape of the body and hug the Chihuahua. This gives the dog a sense of comfort and keeps it away from tearing it off. The ease of wash of the harness is a huge plus since small dogs tend to go in smaller, dirtier places where they shouldn’t. A compact, easy-to-wear design is made by Comfort Fit. The build of the harnesses was designed with a focus on the characteristics of Chihuahuas. The collar of the harness is kept soft so that the wearing and taking off process remains painless and also struggle-free. Chihuahuas love to escape out of their harnesses using their wits. Hence, this harness design comes with two D strings that lock the piece securely with your leash. With a weight of only 2 oz. the harness is definitely one of the lightest in the market. A compact harness like this is very easy to carry around. The Chihuahuas will feel extremely comfortable as the design hugs its body so that it cannot shake it off whenever it wants to. The compact lightweight feature also provides an ease of mobility. This allows the Chihuahuas to feel as lightweight as possible as the weight is negligible. It comes in multiple sizes so it can cater to not only Chihuahuas but also slighter bigger Chihuahuas, corgis, poodles and more. The clip that is fit for the leash to be attached is very hard to find. Especially when your Chihuahua is being jumping all over the place, it will become even harder for you to spot the ring. As mentioned in the introduction, Chihuahuas are prone to have tracheal collapse due to their soft bone structures. Their cartilage and bone build are much thinner than a regular sized dog. Let’s not forget they are one of the smallest dog breeds in the world. This can induce pain and even breathing problems in the little Chihuahua. Hence, looking for a body harness over a collar is recommended. This will refrain from putting pressure on the neck area, keeping them safe. A No-Choke build of the harness can make sure the vulnerable bones are well protected. Because the weight of this particular dog is so low, an important factor that arises is the weight of the harness. Due to their softer, more fragile bone and cartilage structure, it is really important for the harnesses to be lightweight. If not then the weight of the harnesses may exert pressure on their bodies, inducing pain for the little creatures. Chihuahuas are extremely hyperactive dogs with a lot of IQ. If they sense a way out of the harnesses, be very sure you will have a hard time keeping the harnesses on them. Hence, you really need to look out for harnesses with the perfect fit so that the chia can’t wiggle out of them. Because of the fast-drying build, Chihuahuas who love to swim will find this harness comfortable. Along with the above criterion mentioned and emphasized on, the Chihuahua must not feel claustrophobic. This will add to their discomfort and a fit of claustrophobia may lead to unease for your dear Chihuahua. Hence, a harness with a comfortable fabric and air-permeable material is preferred for the Chihuahuas. Another thing that must be kept in mind is the tension control, which the harness provides with the leash. If the tension is not managed well with the build of the harness, it may lead to exaggerated pain for both the user and the dog. It may even cause severe bone dysfunction if there is continued use for a longer term. As it is seen, there are certain crucial requirements that need to be kept in mind before purchasing a harness for your Chihuahua. You should be keeping in mind not only comfort issues but also very critical health issues which in future may harm your Chihuahua in a terrible way. Chihuahuas are extremely prone to tracheal collapses and so have to have made sure that their harnesses are lightweight. Also because characteristically Chihuahuas love to escape them, the harnesses have to be a good fit. Apart from all this, the washability and tension-absorption of the build should also be kept in mind for the convenience of both the user and the dog. Hence, from the above mentioned 6 products, the Chai's Choice Best Outdoor Adventure Dog Harness is the best choice for any Chihuahua. With the adjustable straps to the reflective material, the harness provides all the necessary checkpoints needed for a Chihuahua’s wellbeing. Keeping in mind that Chihuahuas are one of the smallest dog breeds that exists, it is very natural that extra measures need to be taken to ensure their safety. A regularly used product for a dog like harnesses should be bought mindfully so that your furry friend always stays happy. DogBedZone.com does not intend to provide any veterinary advice. We do intense research to help owners better understand their dogs; however, the content on this blog is not a substitute for veterinary guidance. As always consult your vet.